Do you use GPS for your cycling? The short answer is yes because even if you don’t have a bike computer on your bars or a smartphone in your pocket the satellite technology would have contributed to your ride in other ways from making that paper map to guiding the deliver truck that brought the spare parts for your bike to your home or local bike shop. GPS is everywhere and it’s free. How did this happen? 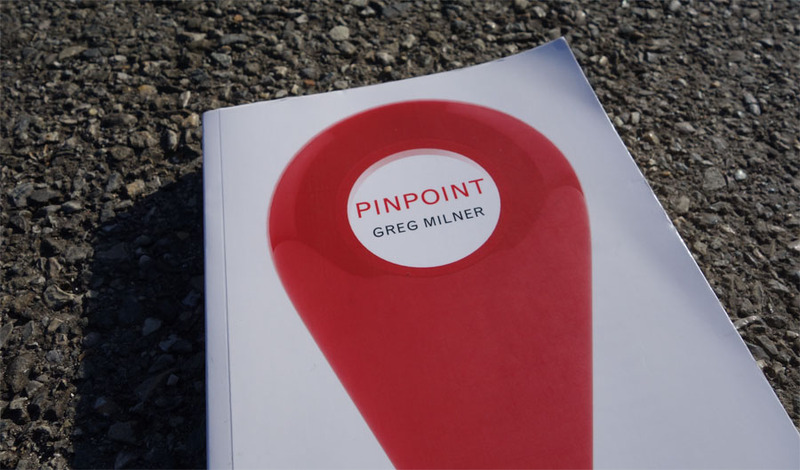 Pinpoint tells the history of its creation and explores the use today. What is GPS? For many it’s a navigation system but the Global Positioning System is really a timing network. A constellation of 31 satellites orbit some 20,000km, each has an atomic clock and constantly broadcasts the time. A device on your handlebars collects the faint time signals and, knowing which satellite they came from, derives your position. Actually there’s a lot more to it which is half the purpose of the book. Like many inventions GPS was born out of war and the space race. The Vietnam conflict saw the US persist with the carpet-bombing used in the Second World War, an ineffective, wasteful and sometimes counter-effective technique. This led to a programme to develop a weapons guidance system with plan to “drop five bombs in the same hole”. For the cyclist peacefully navigating along a canal path or sprinting up a hill this may not be what you wanted to learn. Milner explains the bureaucracy and committee procedures and inter-force rivalries in the US that eventually brought about the constellation of GPS satellites and then the events that led to it becoming available for civilian use. Along the way a chain of unintended consequences, for example the downing of flight KAL007 led the US to make GPS free and available for civilian use, first so that aviation could navigate better but soon it became a commercial product for shipping, yachting and eventually trickled down to your bike. The book never touches on cycling but it does mention Garmin and how GPS has made fortunes for company’s founders Gary Burrell and Min Kao. It remains a military property and over the years the accuracy of GPS has suddenly altered because of a military event here or there, becoming pinpoint accurate when the US military needed it and vague when it suited blurring things for a rival threat. Russia already has its GLONASS network, the European Union is launching Galileo, China BeiDou and so on. But civilian use is so dependent on GPS that it’s hard to imagine the US ever pulling the plug because of the economic self-harm it would impose, from delivery trucks to aviation to seismic monitoring. Milner covers the scope of GPS applications but can still only touch on a few examples, for example an in-depth look at beet farming as an illustration of how our food chains now rely on satellite technology. Back to cycling and consider Strava alone, labelled a social network but really a data gathering exercise to plot location points and the corresponding time of day via a GPS device. GPS is free but has enabled a business with over a million active users. How many cyclists and runners have purchased devices to join in? How many pay for premium subscriptions? How many have upgraded their bikes or shoes in order to be more competitive? The retail spend in this tiny corner is significant and all thanks to a military spin-off. It’s not all wondrous, a theme running through the book is the way society and perhaps even our neurology could be changing as a result of GPS. This is relevant for the cyclist and traveller because entrusting our navigation to screen means we risk lose sight of the real waypoints as we move across the land. Our willing exclusion of the reality of the landscape by surrendering to the electronic screen and turn-by-turn instructions has multiple consequences. Far from being free to enjoy the scenery one suggestion is you could be less cognisant of it. Studies suggest GPS may allow travellers to reach their destination more efficiently but this comes with the price of being less aware of the surroundings; others say the brain can even change. But this subtle and tentative, it’s hard to untangle scientific analysis with jarring and graphic stories of truck drivers getting stuck on a twisting mountain road. The book convincingly argues GPS is a valuable public utility, as useful as the internet even. Cycling has only just begun to grasp this. Many will use a Garmin for route mapping, plenty will use Strava for training for kicks but this is only the start. The Transcontinental relies on it Telemetry is coming to TV broadcasts of races, although painfully slowly and too often shares the irrelevant – such as heart rate – instead of the essential: who is in the front group? Think of all the other uses: enhanced timing chips? Settling WADA Whereabouts disputes? A new form of race where participants don’t know how long the course is, only where the next checkpoint is? An enhanced reality game created by, say, a Flanders tourism agency where you collect bergs and cobbled sectors? If it’s got anything to do with location or timing then let the imagination run wild. The book has no mention of cycling so why review it on a cycling blog? This is a handy primer if you’ve ever looked at your Garmin or smartphone and wondered how it it can place you on the planet. Think for a second and you might wonder who paid for an entire satellite system that enables you to brag about riding down a road faster than a friend or stranger? Pinpoint gives a good look at the background to the technology and to all its applications. It’s an easy read, blending popular science and history into the kind of prose you’d find in a magazine. Each chapter could stand up by itself in a magazine or newspaper, it’s not the kind of science book where you have to grasp the early material in order to understand what follows. GPS is everywhere in cycling whether touring, training or racing. Even if you appreciate the bicycle for its simplicity and eschew electronic gadgetry then you might find validation in the sections on how GPS devices could be undermining our instinctive navigational abilities. It is so powerful an application that it lets us know exactly where we are, a feat we’ve quickly taken for granted but for millennia a matter of survival. But it still won’t tell us where we’re going and why. If it was borne out of the US’ Cold War space programme, then it has its ultimate roots in Germany’s WWII rocket scientists presumably? There’s Sputnik too, the pulse sent out by the rocket was a primitive form of what today’s GPS satellites send out. The book goes as far back as the spread of humans across the Pacific islands and “etak” navigation (http://www.canoeisthepeople.org/navigating/etak_system.php). It explores this but still leaves you wondering. Perhaps there’s causality, that some are better at navigation and spacial awareness but it’s only very recent – a generation or two? – that most of us have used maps and travelled long distances. +1 Tim! We’ve played around for years with Garmins, creating GPX files and the like for our tour routes. But so far I’ve resisted (the few) calls for equipping everyone on a tour with these gizmos vs a paper cue-sheet. The few times we’ve given GPX files to clients with their own devices the results have been dismal at best. Not only do they get lost, but they get upset! We’ve had a few vehement arguments with avid users of these things (insisting that we’re in a far different location than where we actually were, for example) so it seems clear to me that these things are not all they’re cracked up to be. Technology’s not always the answer! I’m actually doing my PhD on this subject. Your personal theory is supported throughout the research literature – moreso with pedestrians, not so much with motorists as they are concentrating on driving anyway. I’ve not come across any GPS and cycling work. Studies where pedestrians use either paper maps or GPS maps on their phones see the paper mappers outperform the phone mappers in terms of remembering the space and routes they have just travelled through. GPS is part of the problem and its automated instructions, but the small phone screen is another part (maps are generally much bigger and you can see more terrain, more easily). I had the pleasure of leading Garmin’s IPO in 2000. Messrs Gary Burrell and Min Kao (the Gar and Min in the company name) are brilliant engineers and business men. More importantly, they are the most humble, unassuming and genuine people. Employees, family and community are their true priorities. While aviation, marine and auto navigation were the foundation of the business, cycling and outdoor recreation have become increasingly important elements of the business with the rise of smart phone navigation eroding its auto business in particular. While I appreciate retro cycling products and traditions, I don’t miss paper route cue sheets. In fact, I see more of the world since I am not having to look at a cue sheet and my mileage to know when to turn. In the same way that driver-less cars are being developed, I wonder if auto-navigation e-bikes may become a thing of the future too? Or smart bikes that prevent crashes in the peloton? Or automatically programme Nairo Quintana’s bike to attack from kilometre zero? That type of thing, crazy and wondrous to behold..
Have wondered about the company in the face of GPS on every smartphone and their stock price cratered as soon as phones appeared with GPS chips but as you say they’re compensating elsewhere now. It’s a book I’d heard of but not considered buying. You’ve changed all that, it sounds utterly fascinating, especially the bit about the consequences of the KAL007 tragedy. I just assumed commercial flights had all available navigational aids at that time! You would be surprised! The morass of regulatory and certification requirements slows things down in aviation. While the promise to open GPS up to civilian use dates from 1983 and the first use of GPS in airsports (that I know of) took place in 1991, air traffic control continued to be based on ground radar and ground navaids for at least another decade. GPS was used informally in the cockpit during all this time but official use only became possible after a comprehensive overhaul of the air navigation system. Sounds an interesting read. I’ve led tour groups in the Alps and found riders who use their Garmins become so reliant they easily miss a lot of the landscape and scenery. I’d assumed this was because they were looking at a screen but maybe there’s more to it? Funny that people would go to the Alps to spend the time looking at a screen… Kind of a waste of a trip. Would these devices put you out of work, telling customers where to turn? As suggested higher up I wonder about the causality, are the people ignoring the scenery because they’re following a screen? Or are the people checking their route all the time the same who would miss things without GPS if they had to keep opening a map or looking for every road sign? The book hints that following electronic directions can reduce our spatial awareness so it could be self-reinforcing but how strong this effect is isn’t clear. I’ve also replied higher up the chain here. I’m a researcher working in this area (but in an urban context). In an city environment with a GPS, people do miss the scenery. Navigating with GPS is different to using a map. With a GPS your brain is ‘off’ spatially-speaking (the GPS knows where to go so why do I need to think about it?) but brainpower is need to process and manipulate the interface. With a map, it is simply unfolded and more brain power can be used to process the surroundings. Hence, map users remember the environment and scenery more than GPS users do (very clearly shown in the literature). However, this is in a city. In the alps, I’m not so sure, but it would be somewhat comparable I imagine. I’m only a couple of chapters into this book BTW. A good read so far. Recently after using a GPS app on a cycling road tour in Vermont, I became exasperated with confusing cues and very country roads with no signage! three forks turn on which one?. Ended up going “old style” topo and best map could fine. Welcome back Inrng, hope you had a restful trip. Great way to start the 2017 Inrng season. Interesting piece. It’s easy to forget all the ways that GPS is applied throughout our society. However, it’s definitely worthwhile to note that GPS has very significant limitations for route finding. Other commenters who complain about GPS apps’ point-to-point directions definitely hit the nail on the head – never rely 100% on a GPS route. Old school maps and route knowledge far outweighs GPS. And for crying out loud, when you get on the road, don’t spend your time looking at your GPS/powermeter/smartphone/pokemon Go/etc. real life is much better than screenlife. Now that I sound like a grandpa, thanks again for the interesting article Inrng. Uncorrected GPS in real time is accurate to to 5-10m now US have turned off anti-spoofing – that took it back to around 50 to 100m accuracy. Trees and urban canyons make accuracy lower or take longer to get a fix. The atmospheric effects preclude much greater accuracy on stand alone GPS. Surveyors and those requiring greater accuracy use corrections from known locations (real time and post processed) and/or measurements over hours to get cm or mm level accuracy plus precise data from satellite orbits. Your phone/Garmin positions you to 5-10m and Strata et al cleverly snap you to their network to compare you to other users. Most consumer Sat Nav issues are related to poor data in the device not poor position from GPS. I grew up with maps but like my GPS for tracking. Sorry did not mean to be anonymous. Book sounds a good read. PS Z or height accuracy is worse then the figures above. I assume Strava et al use a fixed terrain dataset to provide the elevation gain based upon the route in 2-d. Some Garmin-esque devices have barometric altimeters, which is a more accurate way of getting relative elevations. Fortunately, at least for some countries, good topo maps are available digitally, so you can have the best of both worlds in your pocket while out on a ride. You beat me to it on the general relativity comment. It is absolutely amazing that such a widespread technology actually needs to take into account something as ethereal as the curvature of space to work. correctly. Welcome back, Inrng! We missed you! Before GPS was easily available (and when it involved rather large receiver things), one of my friends was working for the USGS. There was a big wildfire not far away, and fire crews were lamenting the difficulty of getting accurate information about where the fire was. So my friend said he could help, and went up in helicopters with his receiver thing to get accurate information on where the fire was for firefighters. It seemed amazingly cool at the time (still does, to me)! I do not rely on the GPS for going places but I find it quite interesting to download the file and analyse after a training ride. And it really is impressive how far this has come. Sounds like an interesting read for the winter. Btw, I have the exact same model as the Miss Boels-Dolmans albeit mine is a Garmin Edge 500. I wonder how she got a similar looking but Quarq made? Quarq/SRAM don’t make bike computers so their pro teams get branded devices like this. Yeah, I figured… If you look carefully when at a top level race, you can spot a lot of this equipment being used. I have a GPS navigation computer for my bike and remember heading into the Yorkshire Dales alone with a route planned out hitting various steep hills along the way – about 80 miles into the route realised my legs were betraying me and was going to be grovel to complete the rest of the hills planned so decided to click to navigate home abandoning the rest of the route. Computer said it would take me about 2 and half hours to ride home which was fine. On I rode for a few miles but then realised the road I was riding down the tarmac was slowly disappearing and eventually turned into a rough gravel track made up of large coarse rocks and pebbles!! I was riding my carbon road bike with skinny tyres which was certainly not up to the terrain and I only had one spare inner tube with me. Looked down at the computer to tell me to continue on a rocky path, assuming I would eventually return to a proper road I began carrying my bike while sheep were milling around me as continued on, climbing over stone walls even crossing a little stream all the while clopping about in my road shoes with cleats as I couldn’t ride any of it without risking a puncture or tearing my tyre. The map on my screen offered me no clue as area surrounding the ‘road’ was just green fields with no clear alternatives, ended up walking like penguin for about 4 miles carrying my bike and then I could see Menwith Hill (The RAF base with distinct golf ball type radars) in the distance so took some comfort that as long as I headed in that general direction I would eventually return to a proper road. Eventually I got back to a proper road and continued home with the route providing me with nice flat tarmac! At the time I was fuming and berating the stupid GPS computer navigating me to such a route that I couldn’t ride but now I can look back and laugh. It’s no wonder why taxi drivers in London have to pass the dreaded “Knowledge of London” test. Many people think it is outdated and only part of the British tradition, but the simple fact is that Sat Nav (GPS is a Yankee term) does not always work, or has incomplete information. A cabbie, in a documentary, recounted a story about a truck getting stuck under a low bridge because the driver just followed the GPS route until he heard a bang overhead! Glad you can laugh. It’s the limitations of the ‘map data’ in the Sat Nav that caught you out not the GPS positioning. Surprisingly common. Ever been directed off the Motorway/Freeway then straight back on again? Missing or erroneous data for the motorway. Implications just worse in remote areas or for self-propelled users. In your case probably an off road route classed as a road computer says use it :-). Like UHJ, I find GPS data more useful and more interesting after the ride. Not only to see how I place in the segments but also to see where I have actually been; group rides can still take unfamiliar roads and take me places I do not recognize – and sometimes, especially during the cyclocross season (read: the road bike is given a rest because the weather or the road conditions are just too much for it), I even ride “blindly” taking any road I happen to fancy and either find myself in a cul-de-sac or, after a number of miles in I-have-no-idea-where-I-am back on a road I know. Not usually the software or the hardware but almost always the map data at fault. I like using GPS, combined with the Osmand open street map app, to explore areas I do not know well. If you combine GPS with an accurate map (electronic or paper matters little in my opinion), it is a great tool and I find that I spend less time staring at the map and more at the scenery because of it. I’m in the trail biz. We have access to Strava data. I’ve used it to map exact-ish locations – that is, good enough for the work I do – of trails under 100% tree canopy (ie invisible to satellite imagery). Doing so has improved accuracy of my trail maps (and incidentally added about 10 miles to the measured length of my trail). These map lines often contradict the basemaps (no matter whose maps they are) – a simple illustration of the vagaries of Other People’s Maps. Having a Sat Nav on my bike is something I couldn’t possibly tolerate. I ride to get away from all this type of sh**!